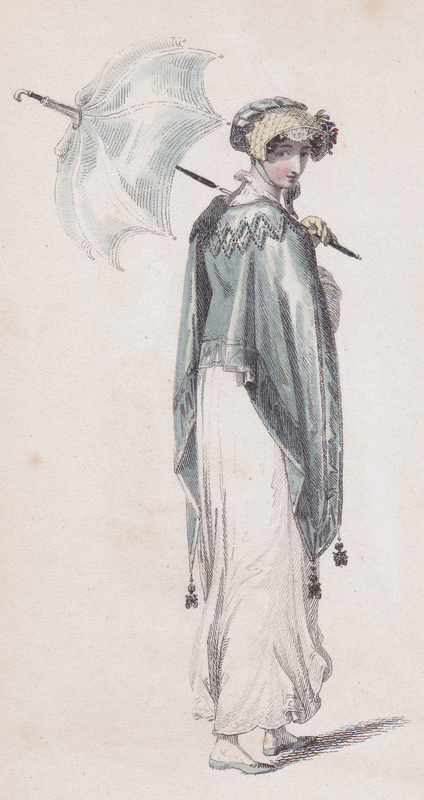 The Great Parasol Mystery – or Which Way Is Up? 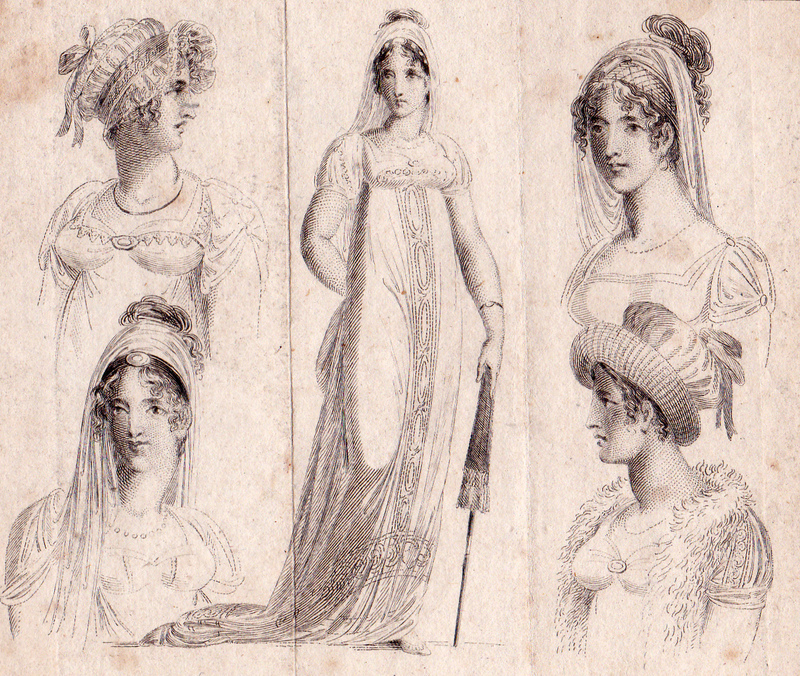 I have a large collection of original fashion prints 1795-1825. All right, I admit it, an indulgently large collection and a bit of a fashion print habit. 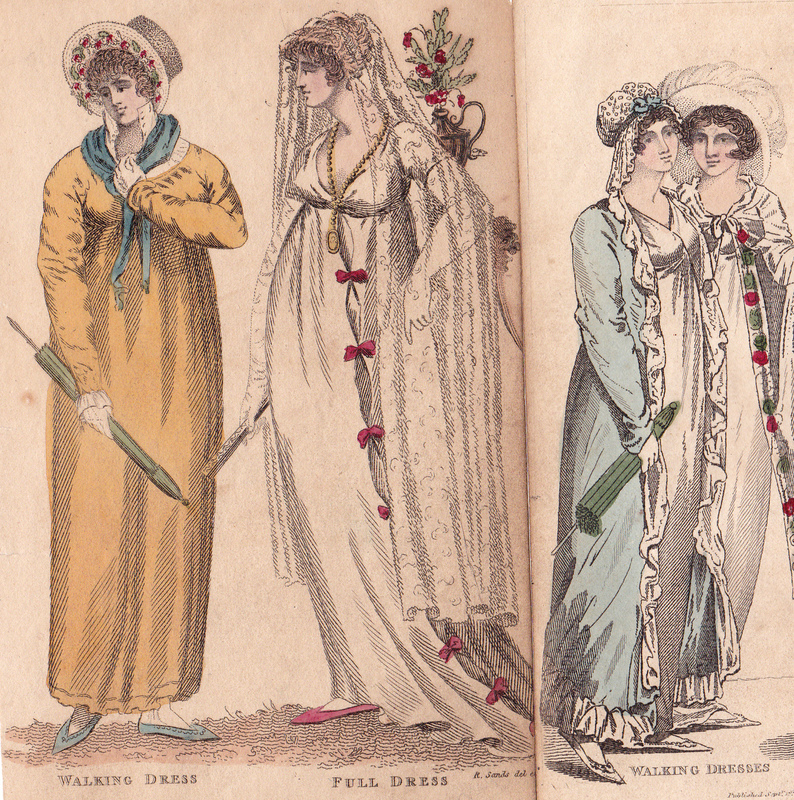 But having so many does allow me to notice trends I wouldn’t normally spot – how the way long evening gloves are held up changed, how fans were held – and, something that has mystified me ever since I first saw it – the way parasols were carried. These days we carry our umbrellas (and parasols, if we have them) by the curved handle which finishes the long shaft. At the other end, protruding from the top, is a short extension of the shaft ending in a metal ferrule to protect it when it touches the ground. 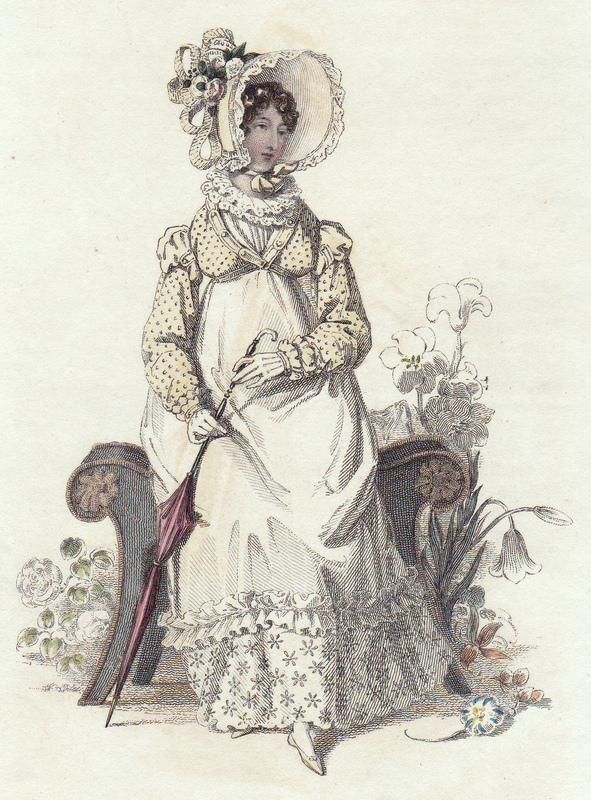 The lady wearing a Walking Dress in this print of July 1819 (Ackermann’s Repository) is holding her parasol in this way (Note the ring around it to keep the folds under control). 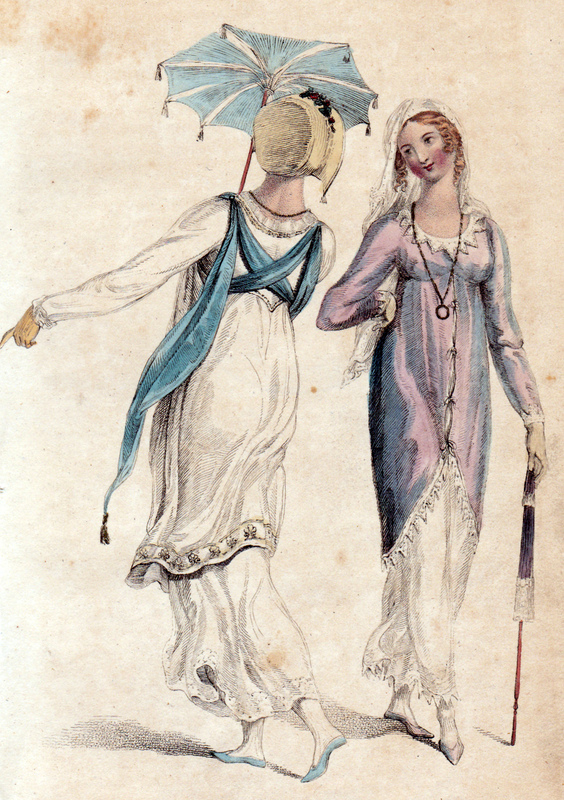 But before about 1816 the vast majority of the prints I own show the parasol being held either at its body like the pair of prints below, or by the short length of shaft at the top. 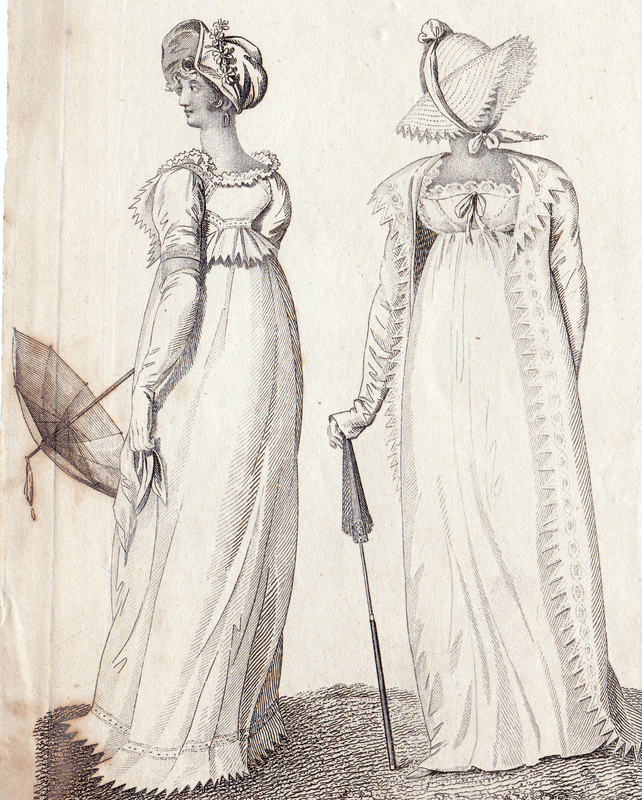 I’ve included a variety of prints below to illustrate the ‘upside down’ way closed parasols (and I can only assume umbrellas also) were held. 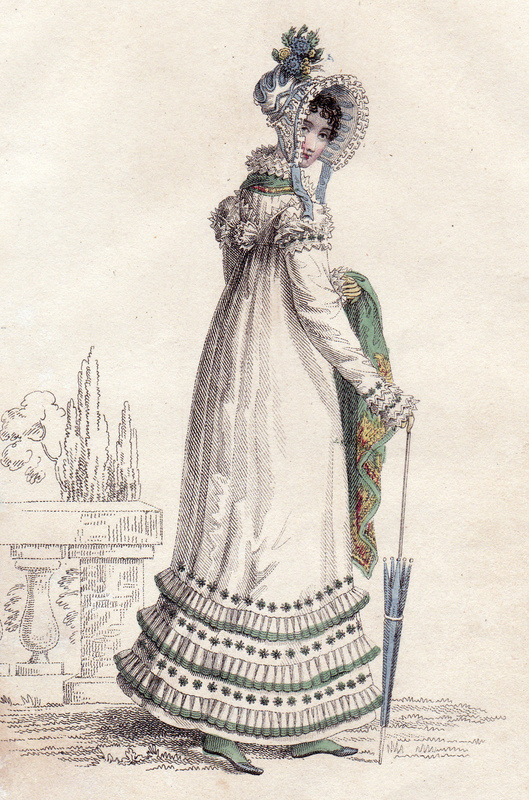 The 1807 print shows a carrying loop at the top of the open parasol and the tasselled design for 1809 shows an opening mechanism just like a modern umbrella. 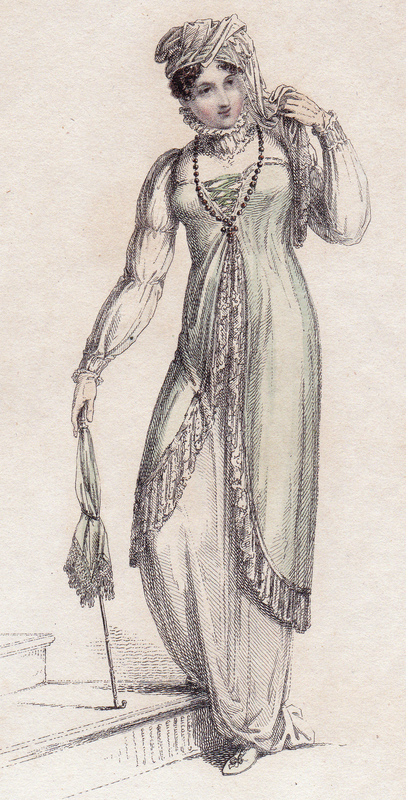 Even when a hooked handle appears (1812 & 1813 prints) it is at the top end. Then gradually I find them being shown the ‘right’ way up from 1814 onwards, although not exclusively – it doesn’t seem to settle down to the modern way of doing things until about 1817. But what I can’t understand is why the upside down way of holding the closed parasol persisted for so long. Surely this method meant that the lady risked soiling her gloves with dust, mud or grass when she carried the parasol/umbrella open? 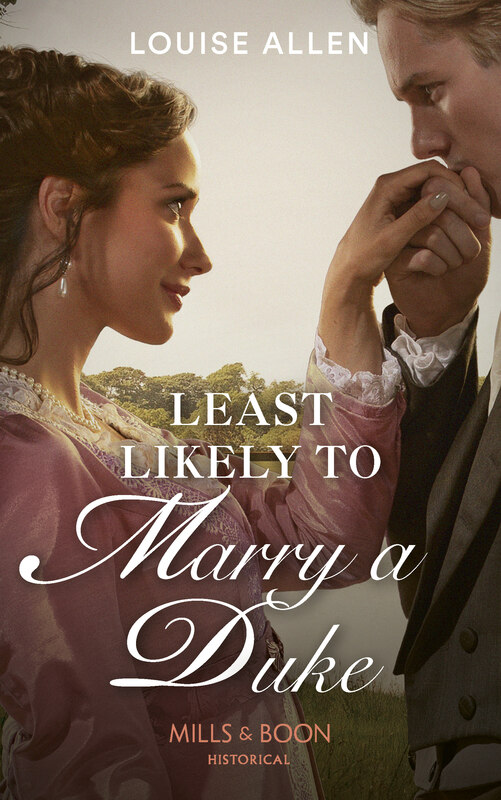 None of the books I’ve looked at even mentions this. What do you think?